This issue features a new book about the Ashram main building, the block of four houses where Sri Aurobindo and the Mother lived for more than fifty years. Concerned almost exclusively with the physical structures, Sri Aurobindo Ashram: The Story of the Main Building traces its history, which began when Sri Aurobindo and the Mother moved to the Library House on 25th October 1922, paying as rent the then handsome sum of one hundred rupees per month. Soon the Rosary House and the Secretariat were acquired and finally the Meditation House, into which they moved on 7th February 1927. Thus a small world was created within the compound walls of these now connected properties—a world that was the very centre of the lives of all the sadhaks. Renovations, reconstructions, alterations and additions to the structure are all detailed here through the text, quotations from letters and other documents written during those early years, detailed graphic explanations, drawings and diagrams, and many old photographs, often juxtaposed with similar views of the same scene taken recently. The result of this meticulous research is a book filled with interesting details that will be new to many readers. More significantly, perhaps, is that the book helps to recreate an atmosphere from those early years, when an important part of life at the Ashram was the daily contact of the disciples with the Mother within the Ashram compound. In that context we asked a few sadhaks to share some memories from those days—memories that contribute to the story of the Ashram Main Building. Tara-ben Patel, after two earlier visits, settled in the Ashram in 1930 when she was 18 years old. In those days everyone took up a work assigned by the Mother. Tara-ben and her elder sister Lila-ben were asked by the Mother if they would like to do the cooking. Lila-ben replied that they were just village girls from Gujarat and didn’t know any dishes outside of their village cooking. When the Mother offered to teach them, they happily agreed, and soon took up the work in the tiled-roof kitchen that stood in the centre of the courtyard. You can see this building here, with the branches of the Service Tree resting on its roof. The sisters would prepare a variety of dishes after looking at the available vegetables. When once asked by the Mother to repeat a particular preparation that she had liked, Lila-ben replied that she could not at all remember how to make it. She had cooked it while in a trance-like state of inspiration, thinking only of Sri Aurobindo and the Mother. Thus began the Mother’s Kitchen, which ultimately was shifted across the Rue Saint Gilles to the place where Grace is now located. The Mother’s Kitchen only closed after Dyuman passed away in 1993. Tara-ben worked in this kitchen and also at the Dining Room up until this time. In the Prosperity courtyard there is a small garden which back in the 1920s was a lush banana garden. The photographs above clearly show the transformation of this space. Noren Singh Nahar recalls that several years after he came to the Ashram in 1936, he asked the Mother if he could take up gardening work. 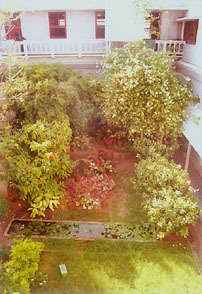 One day in 1940 she called him to the window in Pavitra’s room on the first floor of the Secretariat, where he worked on the Ashram stamp collection, and pointing to this small garden area, asked him if “this would do”. And so he began growing vegetables for the Mother. In the morning before Balcony Darshan he would pluck the ripe vegetables and put them before the Mother. He recalls that she was especially fond of green beans and tomatoes, of which he even grew an heirloom variety called the Mikado tomato. When Ali and Alice Hyderi came to the Ashram in 1940 or ‘41 they suggested he also grow asparagus and artichokes. While he grew many varieties of vegetables, the artichokes were not a success! Noren Singh-da also remembers that the place was used for growing paddy, which he used to water daily with more than one hundred cans of water. But the soil was not good for paddy and only a few stalks came up. 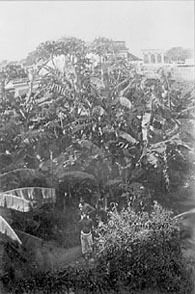 This was the first attempt at farming in the Ashram, before the Cazanove and Rizière farms were acquired. 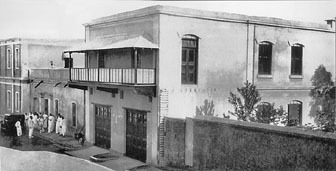 Almost immediately after the Secretariat and the Library House were purchased in 1929, construction of the Balcony block began, providing one long hall and a room for Pavitra upstairs and a place for his workshop, the Atelier, downstairs. When Robi Ganguly came to the Ashram in 1941 he was just ten years old, and the Balcony block and the new Secretariat building had been complete for almost ten years. He was given work at the Atelier, very simple work for a child such as turning on the bellows, and he remembers that tinning, or the enamelling of old pots and the like, was going on in the portico outside the Atelier throughout the day. The Mother, who spent most of the time in her salon on the first floor across the courtyard from the Atelier, was serenaded with the tok-tok-tok sounds of the tinning work. Robi-da remembers with what joy everyone worked throughout the day. No one sat idly by; all were carried along in their enthusiasm to do the Mother’s work. 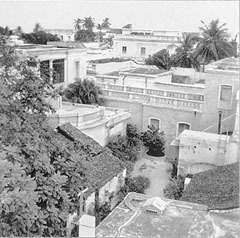 The block of four houses that we know collectively as the Ashram Main Building was the abode of Sri Aurobindo and the Mother for more than fifty years, from October 1922 until November 1973. This book tells the story of how the houses – the Library House, the Rosary House, the Secretariat, and the Meditation House – were originally taken on lease, subsequently purchased, then renovated or reconstructed over the years. 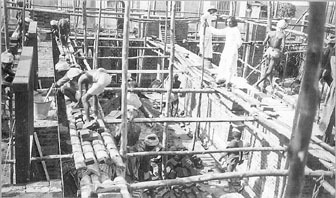 Later chapters describe the construction of the Mother's rooms on the second floor in 1962 and the history of the central courtyard where the Samadhi and the Service Tree are located. 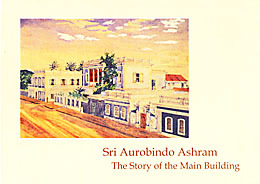 The book, printed entirely on art paper, records every structural change since the time Sri Aurobindo and the Mother moved in, using detailed drawings, explanatory graphics, old photographs, extracts from letters, and notes from some of the early sadhaks as it traces the story of the Ashram Main Building. This compilation presents some of the Mother's conversations and talks on subjects of a psychological nature. The selections cover such topics as the unification of the inner being; ego, desire, and opening to the adverse forces; the play of the universal mind; using sleep, dreams, meditation and concentration to become more conscious; and the nature of the inconscient, the subconscient, and the subliminal. In the Introduction the compiler provides a brief background to the relationship between Indian and Western systems of psychology and compares certain aspects of the work of Freud and Jung to the psychology of Integral Yoga, quoting from the work of Indra Sen in this regard. An Appendix of one hundred pages includes articles on related topics by the compiler, David Johnston, and Raymond de Becker as well as extracts from the books of Satprem, Nolini Kanta Gupta, and Kishor Gandhi. The Mother's correspondence with Shyam Sundar.